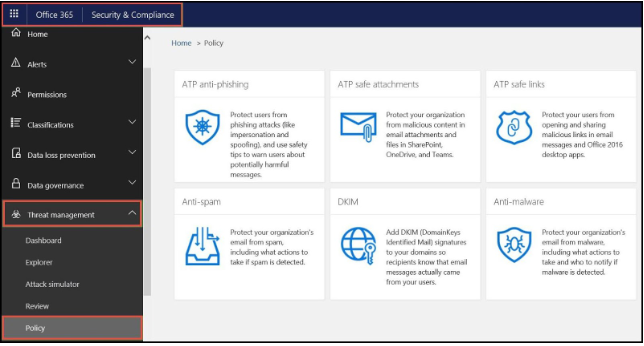 ATP anti-phishing protection is a part of Microsoft Office 365 advanced threat protection. This helps in securing enterprises from harmful impersonation-based phishing attacks. A phishing technique is used by attackers to achieve crucial information like financial information, account login credentials, business core documents, etc., from the target machine. Attackers attempt different smart tricks for the creation of a sense of urgency for motivating end users to click on a malicious file so as to spread the virus in the shortest time period. Therefore, if you are an Exchange Online tenant enterprise security or global administrator, setup Office 365 anti-phishing policy in your account. Phishing attacks are present in a variety of forms to deal with attacks ranging from commodity-based to targeted spear. In today’s era where already lots of working stuff is present, it is difficult for a tenant administrator to determine sophisticated attacks. To help out customers with this problem, Microsoft introduced this policy in Office 365 advanced threat protection. It is present with a limited set of anti-spoofing protection, which is aimed at the prevention of deception-based and authentication-based attacks. 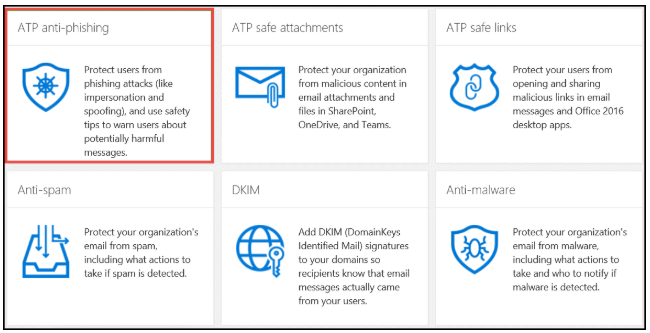 Please Note – Microsoft offers Office 365 anti-phishing policy only for Enterprise E5 license users. If your business is working with another license, you have to purchase ‘Advance Threat Protection’ as an add-in. Also, ensure that your industry works with the latest edition of Office 365 ProPlus on Windows OS for taking complete benefit of the respective policy. Ensure that you are an authentic member either of Enterprise administrators or Security administrators role group. Read each and every option provided on the official site of ATP anti-phishing policy. When you are done with reading of policy options, patiently decide that how many policies are required for your business and then, give priority to each of them. Prepare your mind with the fact that you are going to spend 15-30 minutes in setting Office 365 anti-phishing policy. Now you are going to find +Create button on which you have to attempt a click. Here, you will start with creation of new policy for prevention from phishing attacks. An anti-phishing configuration window gets opened in which you have to describe the policy name and provide its short description. Click on Next to proceed with creation of Office 365 anti-phishing policy. Next comes the section to choose a domain name for configuration purpose. You can select the option for custom domains to be enforced in Exchange Online tenant through this policy. A ‘Review Your Settings’ page gets loaded in which you have recheck all the entries made by you for new policy, carefully. If you desire to change configuration, click on Edit link. Finally, click on Create this policy button to implement this newly created policy in all associated user accounts. The phishing attack is basic source of tension for enterprises today, specially for those who are having online business. Microsoft realized the pain point of its clients, and being a responsible CSP, it introduced Office 365 anti-phishing policy. Now its time for customers to wake up and utilize the add-on provided to them for experiencing a safe working with cloud computing technology.